Ladies, enjoy cocktails every Thursday! 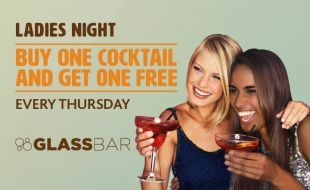 Buy one cocktail and get one free at GlassBar every Thursday. Bring your friends along and enjoy splendid views of the Lowveld! Picture your favourite cocktail. It could be a Pina Colada or a Long Island, a Strawberry Daiquiri or a Mojito. Savour the alchemy of flavours. Visualise the collision of colours. Inhale the fusion of scents. Now imagine that takes seconds to serve. Kegtails is South Africa’s leading cocktail on-tap. Our freshly made cocktails on tap is handcrafted by expert mixologists using the freshest, premium ingredients.